One more anchorage and we’d be in ice-cream delight. All set for an easy sail to another island as we left Lyø. Yet, halfway to our destination I heard an alarm ringing from below. 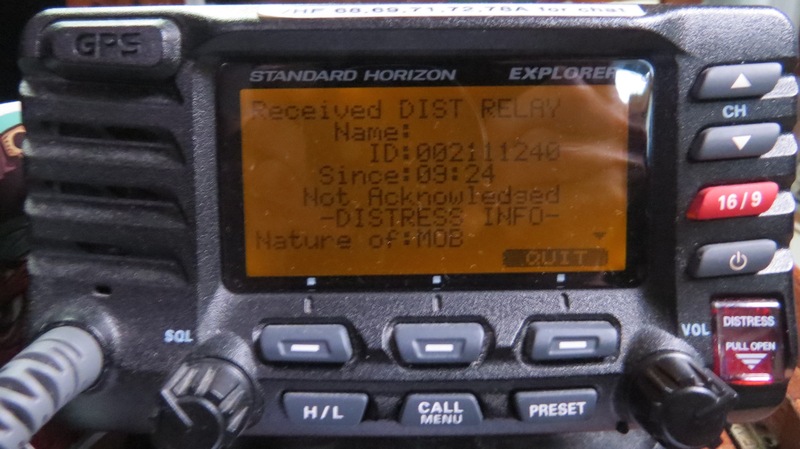 Checking out the VHF (our shipboard radio that receives and transmits by line-of-sight) I saw “Urgency” and “MOB” (man over board) on the screen, something that can create chills. It’s the reason we wear harnesses and clip in and out of steel rings in the cockpit and on lines that run from the cockpit to the bow. Luckily another signal and announcement occurred thirty minutes later cancelling the alert. Good to hear. 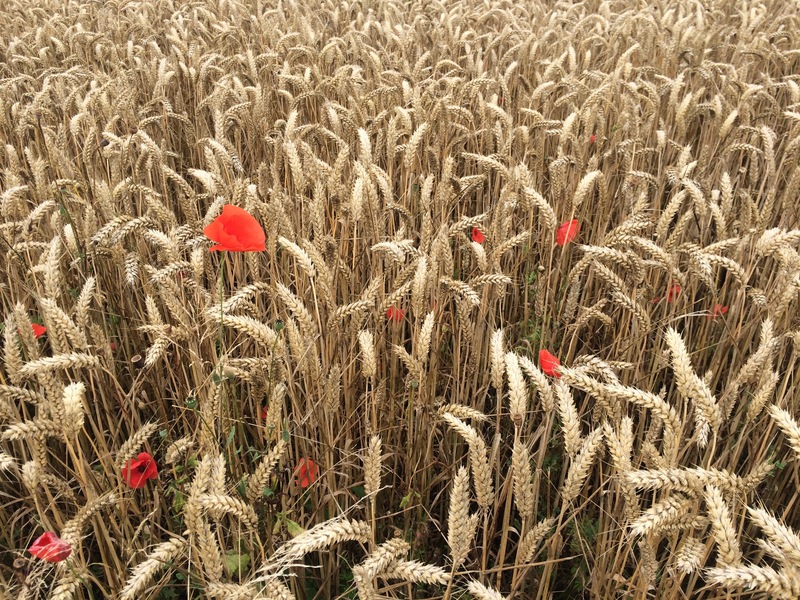 surrounded by wheat with the occasional dots of red poppies springing up amidst the gold. 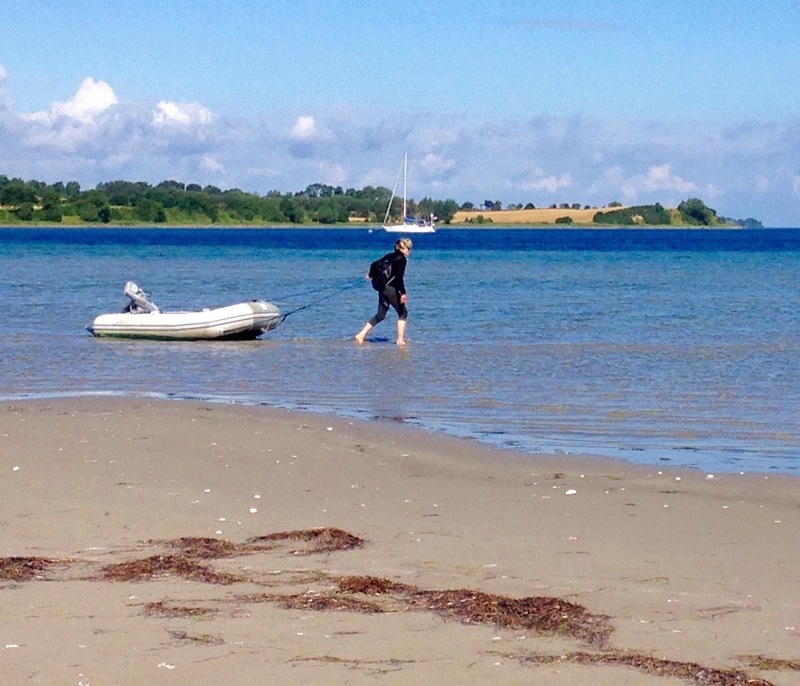 After yoga-ing on the beach the next morning we continued on to our next Danish Island. Although a small marina offered easier access to the shore we opted for picking up one of the free, yellow moorings available for visiting boats. As long as the letters “DT” appear (versus “DS”) you can grab one. With JUANONA happily hooked up, we headed for land doing our usual standing routine to avoid getting soaked by tumbling waves. Once ashore we walked the short distance to Skaro’s ice cream factory and sated our dairy thirst with scoops of delicious, homemade ice cream. 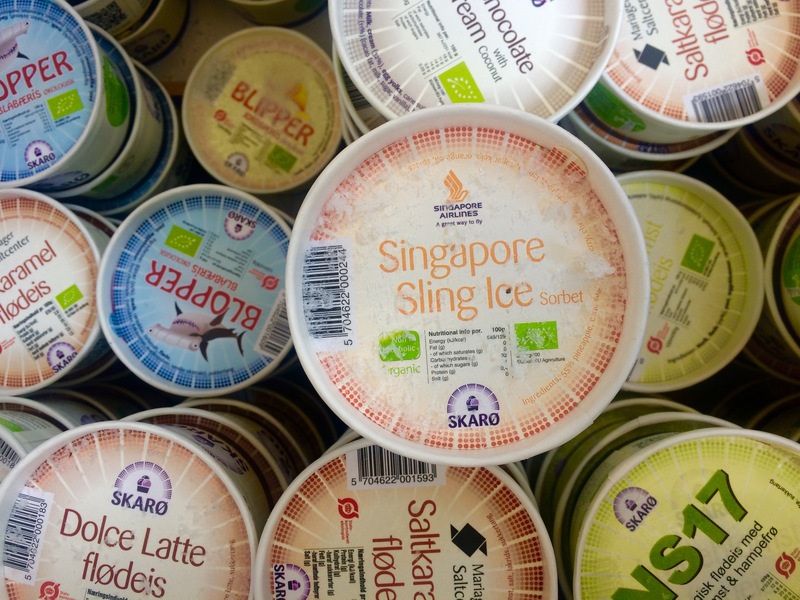 I confess one of the reasons I wanted to visit this shop is how this small, Danish island’s specialty could also be found on Singapore Airlines. I loved the idea of our enjoying our creamy icy treats on earth while others could do so 30,000+ feet in the air. Pretty cool (pun intended)! With plenty of easy walking trails and a few roads we found ourselves in Skaro Kirke built in 1900. Prior to then islanders had to sail or row to the neighboring island of Drejo. I don’t know about you but if I had to row to a religious event I think I’d send a proxy. No surprise when we entered and spotted the votive ship, something we now expect whenever we visit a Danish church. 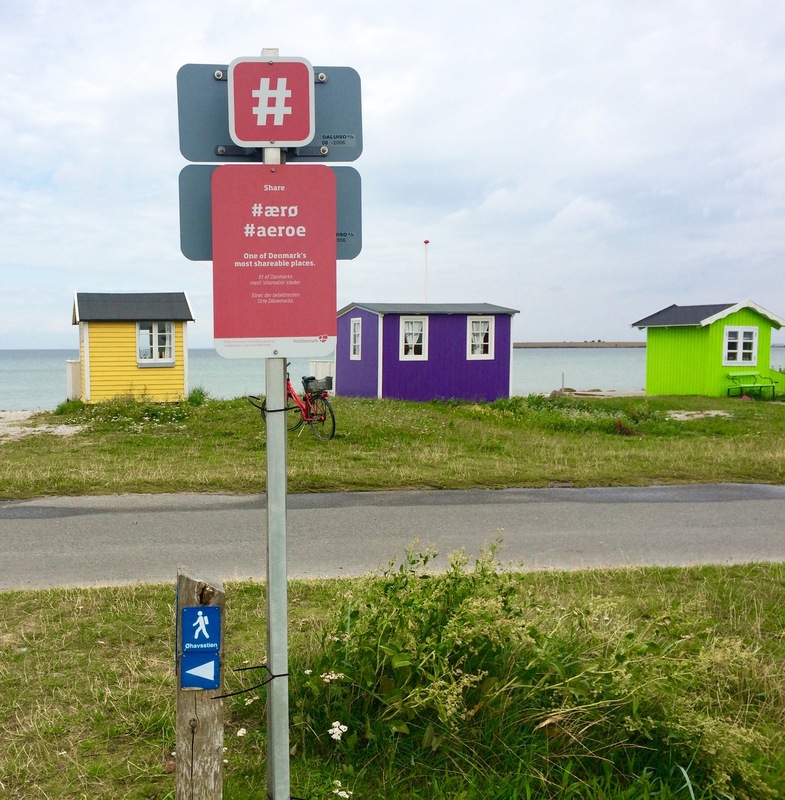 Another reason for visiting Skaro is its proxmity to Fyn Island’s major yachtie town, Svenborg. When I asked a young woman* I had met on Lyo what the town offered, she said a lot of stores. ‘For provisioning?’ I asked. She answered ‘well, more for clothes and other items.’ I felt Max’s deep shudder until he realized a marine store would be part of that grouping. * With so many boaters enjoying many of the same islands, we’re now starting to run into boaters we’ve seen earlier during our summer cruising. Just yesterday I spoke with a Dutch man whom I had last seen in Oslo! A quick ferry ride dropped us off and we headed for Tourist Information where, sure enough, a marine store quickly was identified. and visited two churches, each with several votive ships. What was most surprising is the difficulty in finding a mail box to post a letter. After wandering around the city for several hours during our walking tour we still hadn’t located a place to post our letter. I headed back to the Tourist Information Office where we’d been earlier only to find it closed (on a weekend during the busiest time of the year… go figure). Finally at the marine store where I had left Max I asked the guy helping him. He explained the Danish postal service was slowly going under resulting in mail delivered every three days (!) and the only mail box in the vicinity being at a grocery store a bit further down the road. 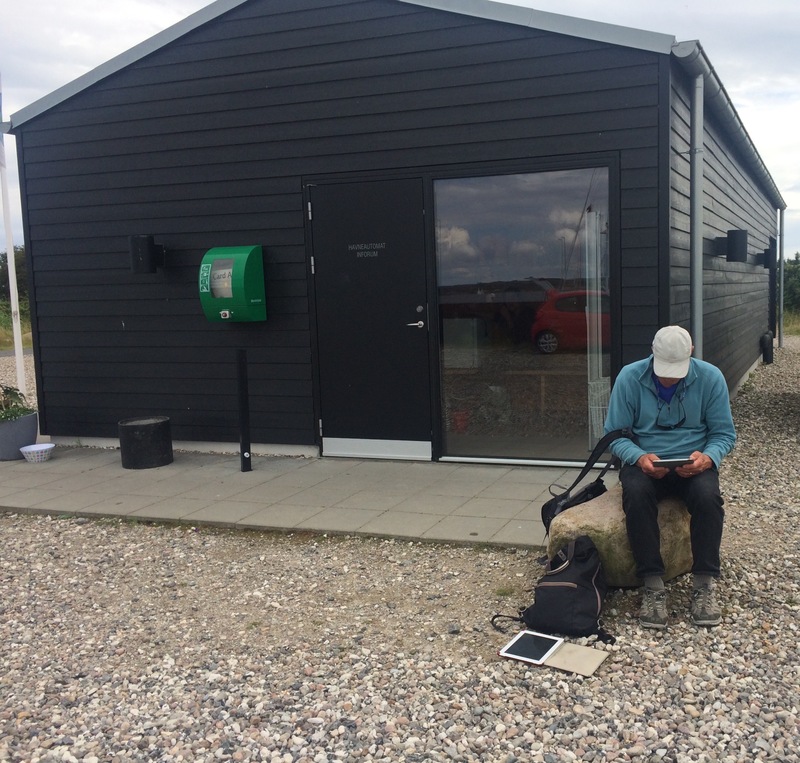 He did say private businesses were picking up the slack, but, wow, we experienced, most likely, the future of our USPS in Denmark. Back to Skaro where we did our usual free-wifi catch-up. During most of this summer cruising we’ve been using Three.com SIM cards for data. Since we want to preserve them we suss out free wifi wherever we go. We generally can find it, yet it’s rarely a strong signal. But, as itinerant wanderers we’re thankful for any and all access, which is why you’ll find us perched outside marina shower blocks among other places. 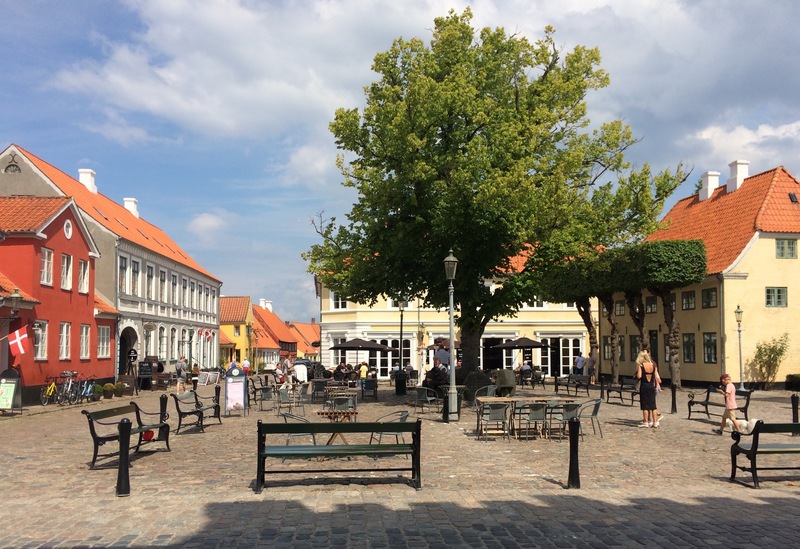 You know how I said we thought we’d seen the prettiest little village in Denmark? Well, we have one to top that–Aero, the island everyone has told us we must see. 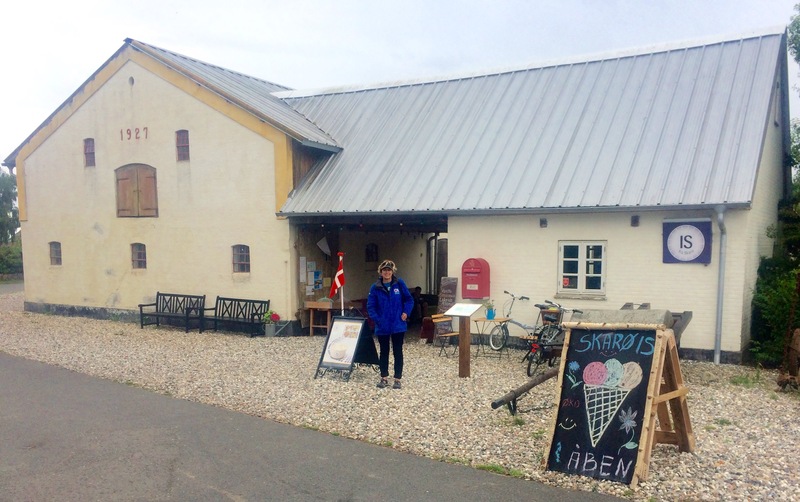 During our first walk-about in one of the island’s three largest villages–Ærøskøbing (the other two being Soby up north and Marstal, south) we completely concur. 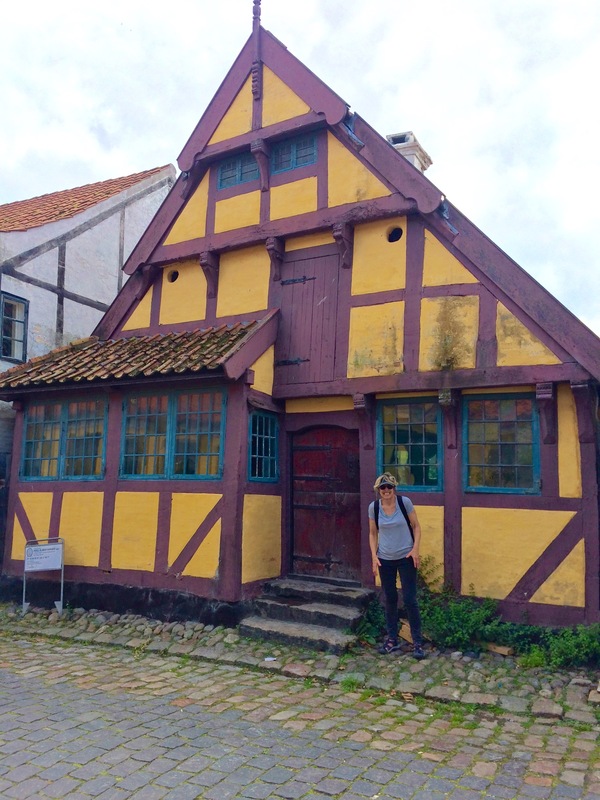 if anyone is looking for a vacation spot filled with a plethora of fairytale homes, beautiful scenery (and many ways to explore the natural surroundings), an extensive maritime museum, and just lovely surroundings, this island has it. Feeling a bit lazy about anchoring we grapped another free mooring ball and dinghied to shore. Just a side note: transporting oneself from boat to land by dinghy isn’t always as straightforward as one might imagine. Sometimes the shoreline doesn’t quite provide enough depth to easily motor all the way. Especially in Denmark where the water level stays shallow for a ways out. That’s when we start using the oars to either row or pole ourselves in. And, when that’s not enough, well, we become human tugboats. Once all of us were ashore (Max, myself and the dinghy) we could enjoy the crisp bright hues of the cabanas like ones we saw in Southwold, England; and, similar to the ones in Britain, these were privately owned on leased land. A twenty-year bickering back and forth between owners and the municipality eventually ended with allowing these structures to remain but with no running water or electricity allowed. As soon as we stepped into the Tourist Office we understood one of the reasons for Aero’s popularity: their approach to tourism. As one local told us (we met him hitching to town one morning) a long period of economic decline meant no money for modernizing the towns. This lack of funds resulted in maintaining the old homes and shops ‘as is’. What initially was considered a disadvantage became a huge bonus when travellers want to step back in time. 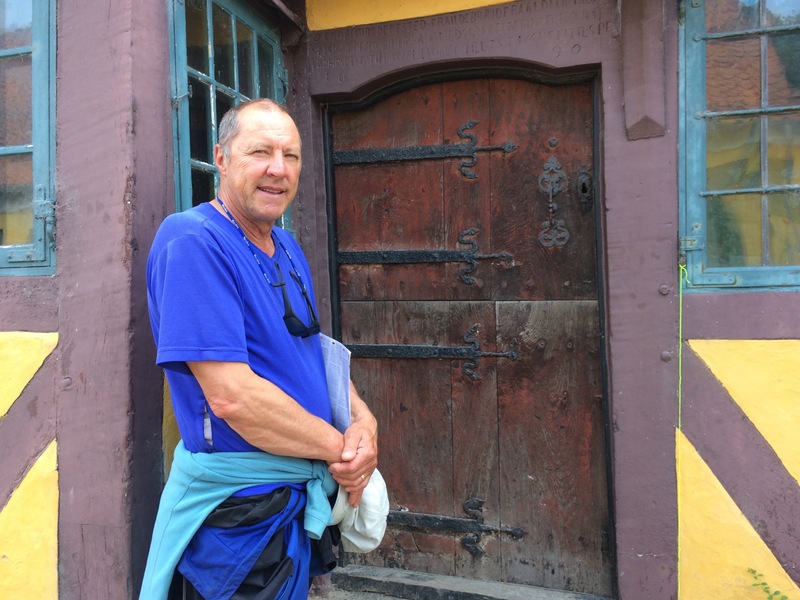 Realizing its potential as a tourist destination, the island poured funds into preserving their buildings. Additionally, locals viewed visitors as guests versus invaders. 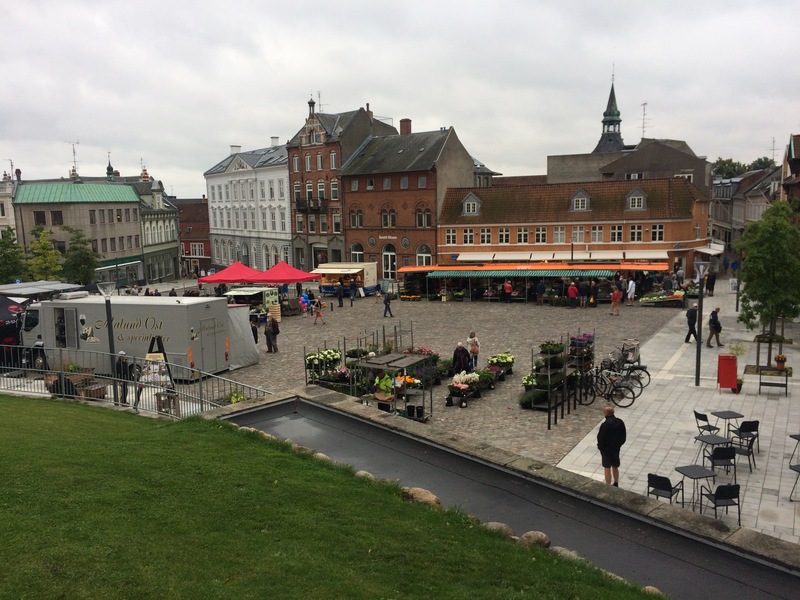 A winning combination: tradtional Danish towns nestled in and along sandy shorelines and rolling meadows inhabited by welcoming residents. 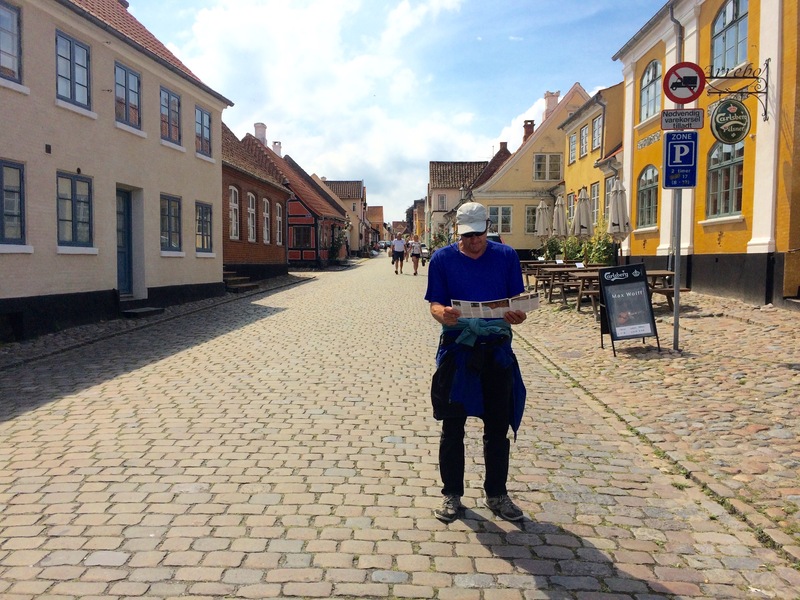 This island is surely a gem in Denmark’s Southern Funen Archipelago. 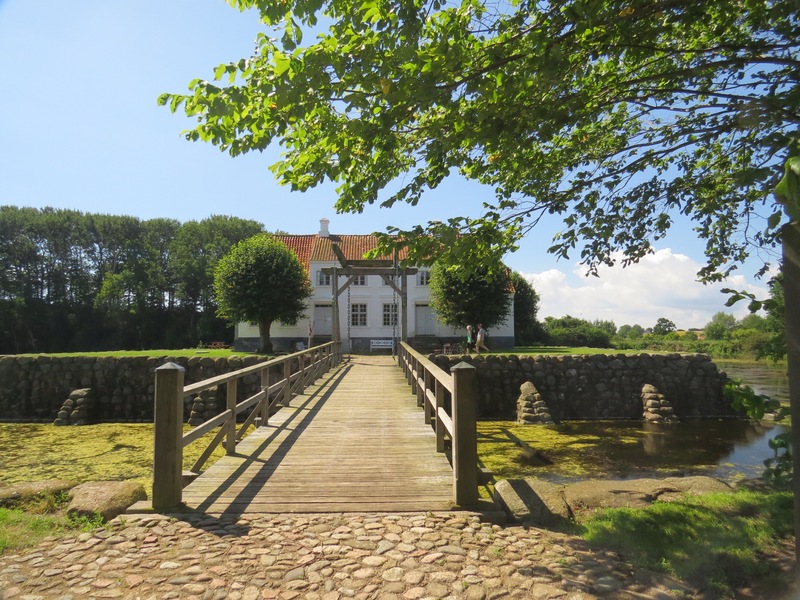 and, the ‘Doll House’ from the 1700s noted as the most photographed house in Denmark (I guess due to its size because it needed a bit of TLC from the looks of it). 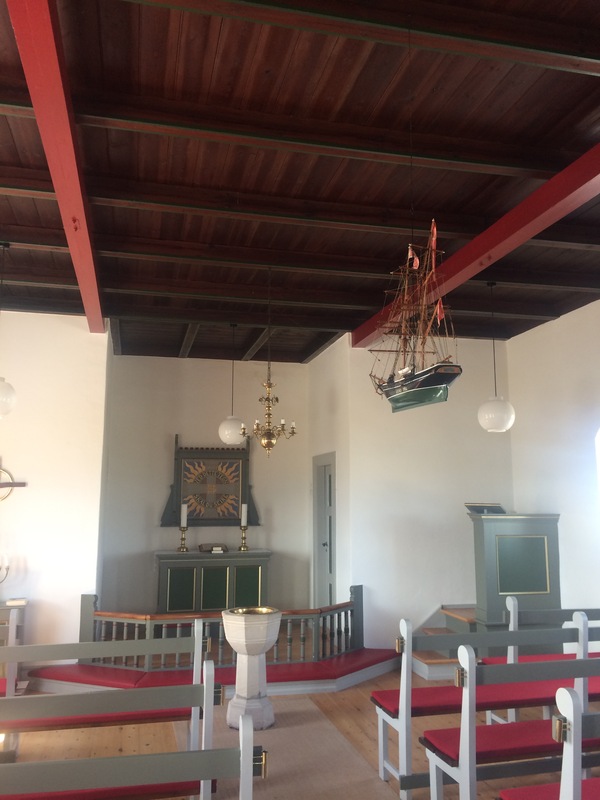 The church is lovely, as to be expected in this town, and featured port and starboard votive ships. And, to enhance the fairy-tale feeling as we walked around, butterflies flittered around butterfly bushes. The next day we hopped on and off the free buses running up and down the island’s 30km length. Laughingly we realized one hour later we’d been in three different sites stopping first at Soby (that lasted for five minutes as we realized nothing much to explore), then to Bregninge. In this village we saw an interesting billboard in front of a house. Curious we approached the sign and discovered an ad for becoming a resident of this island! You can rent this completely furnished abode for a limited time to check out how you’d like living here. Furthermore, a “settlers consultant” is on hand to help you adjust to island life. Definitely an intriguiing prospect! Catching another bus we rode to our third on-off location: Sobygaard, a manor house built by Duke Hans the Younger in 1580, and reconstructed in the 1990s including the drawbridge over the moat. We toured the site pretty quickly. The most we learned about the locale came from large signs covering the historical conflict between Schleswig and Holstein. These neighboring duchies have shifted between Danish and German rule over several centuries with the final resolution coming in 1955 when both Denmark and Germany bestowed special privileges upon their German and Danish minorities respectively. Trust me, it’s confusing! However, I did learn that three wars in the 1800s–between Prussia and Denmark (1864) Prussia and Austria (1866), Prussia and France (1970-71)–led to the unification of all German states (except Austria) under a Prussian king with the capital being Berlin. 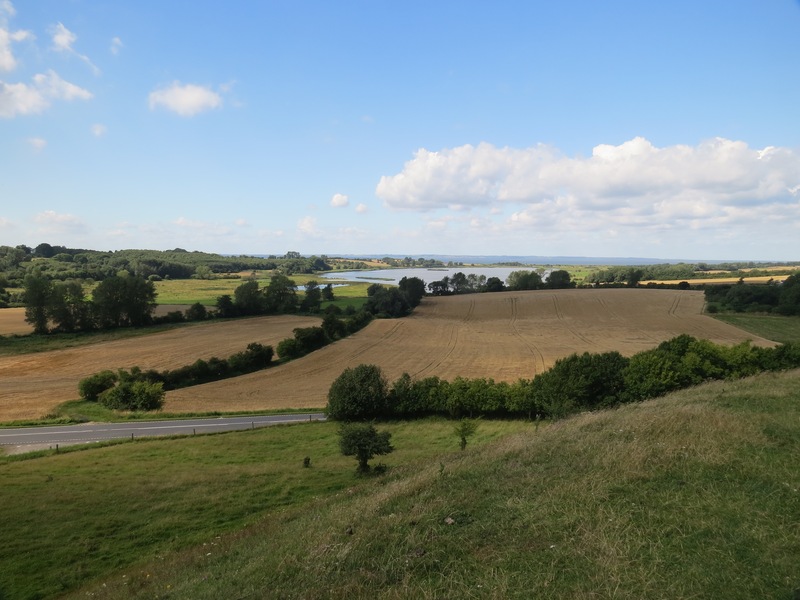 Before we left we climbed to the top of the hill where an 11th-century fortress with views sweeping down to the water. 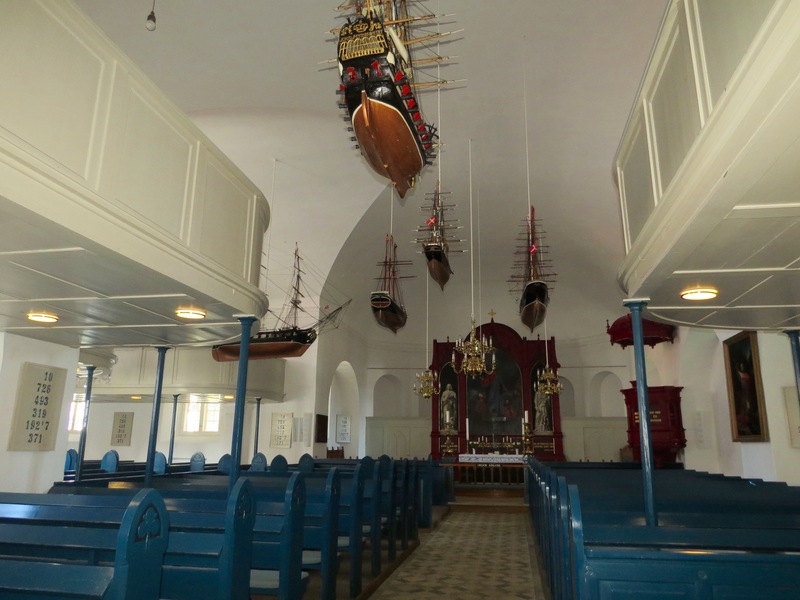 we saw the church with its flotilla of votive ships, one being the second-largest votive ship in Denmark. We timed our exit with listening to the two o’clock chiming of the church’s 48-bell carillon, then walked to the Maritime Museum. I was ready to ship myself out of there but not before catching a shot of a Dane wearing a Red Sox t’shirt (his girlfriend lived in Boston for awhile). There was one part of the museum I spent some time in, that being several rooms exhibiting Carl Rasmussen’s (1841-93) photographs (along with his box camera) and paintings. Having spent time in Greenland, once in 1870 and again in 1893, Rasmussen documented both scenery and inhabitants. I like how he captured some of the cultural aspects of the country even if I thought his renditions of people are a little rough. And, even a bit scary, such as another BHB (big-headed baby). I like best some of his water paintings, especially his use of light. 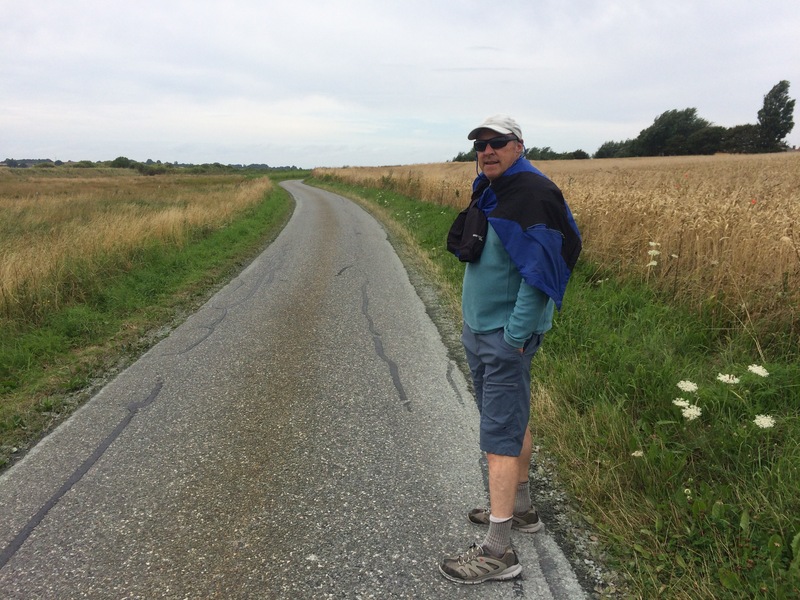 Our last bus left us off on the main road and we had a lyrical walk back to the shore and our dinghy. When we returned to the anchorage we saw a familiar boat, s/v WATERAAP. Sylvia and Pascal, whom we met in the cove at Samso, had arrived! 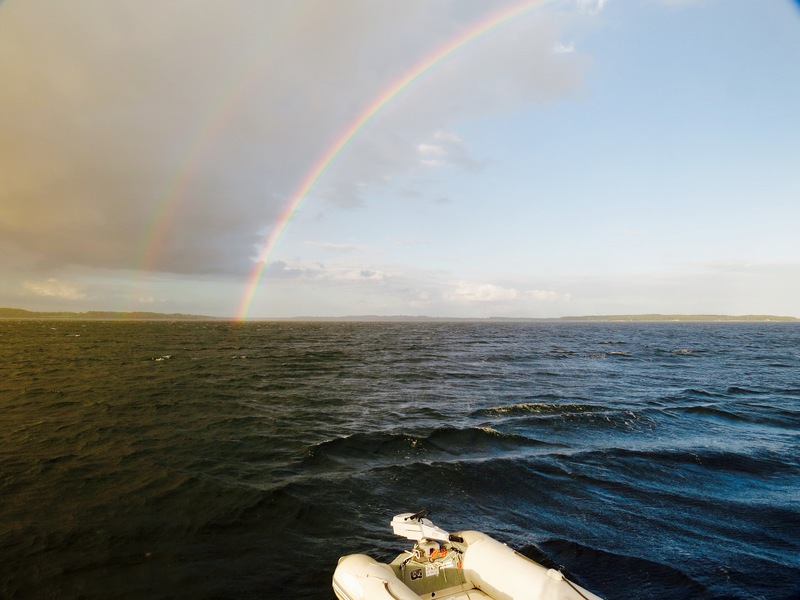 We heard they might be coming but it’s still a lovely surprise when it actually happens in the boating world. 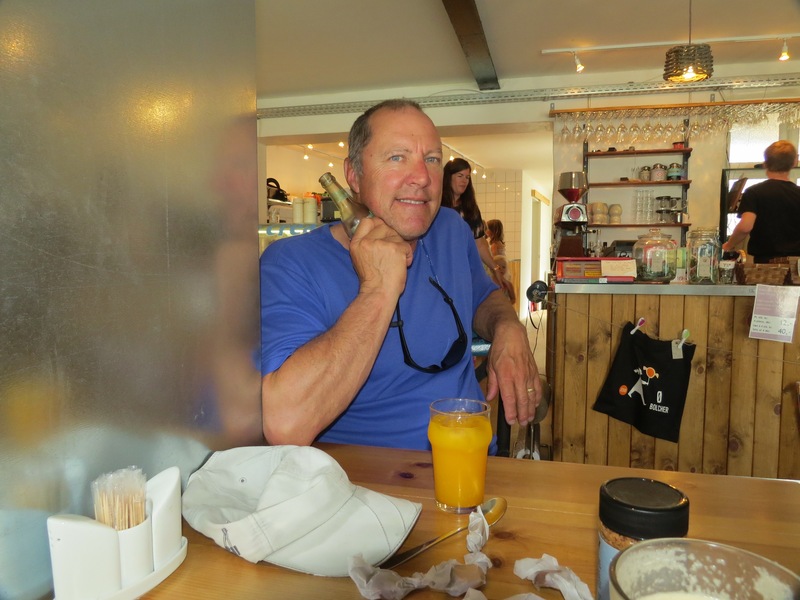 With dinner planned for the following evening we dinghied back to JUANONA and decided to rent bikes the next day. During our ride we were reminded of Aero’s goal of being self-sufficient with sustainable energy and CO2 neutral by 2025. Having met some vacationing Americans from Pittsburgh (and who knew of Beaver Falls where our bro-in-law hails from), we heard of a 5,000-year-old Stone Age burial mound, about three miles from Aeroskobing. We rode along one of the well-kept bike paths and entered the cornfield where this grave was hidden. and stayed long enough to do the other’s selfie and admire the stones placed by Stone-Age people. Hunger pulled us to a cafe as we reached Marstal and spotted an al-fresco lunch opportunity. Time to return to JUANONA where we enjoyed a dinner with Sylvia and Pascal. As you do when in the company of cruisers we exchanged information on sailing routes with both JUANONA and WATERAAP heading for the Kiel Canal the next morning. A velvet sky put us to bed with the promise of fairy tale dreams. Next: Another country’s waters… Germany! 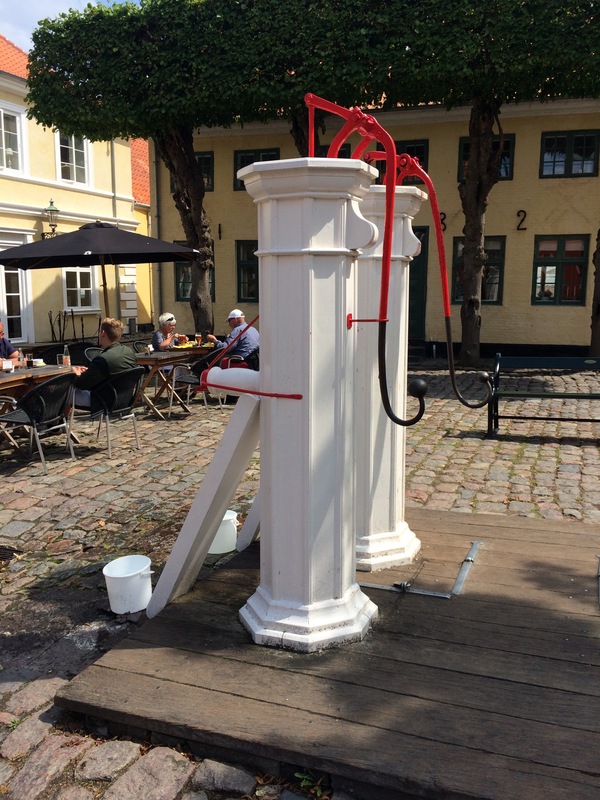 This entry was posted in 2017 07 DENMARK - East Coast & Islands, 2017 Summer Cruising, COUNTRY, Denmark, Europe, SUMMER CRUISING and tagged Avernakø, Ærø, Ærøskøbing, Danish Island, Maritime Museum, Marstal, Skarø on August 9, 2017 by margaretlynnie.